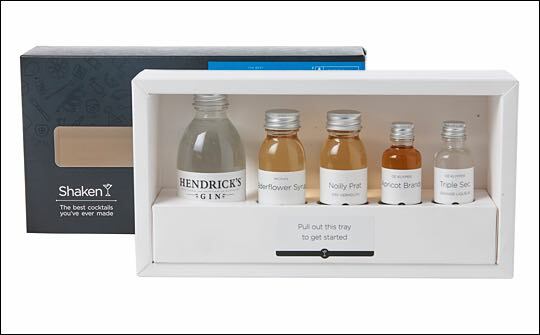 UK start-up businesses Shaken, the subscription based cocktail kit delivery service, launched its first retail packs at Fortnum & Mason last month in partnership with William Grant & Sons. Mark Jennings at Shaken says: “There’s nothing better than whipping up cocktails at home, but we know having to buy full bottles of each ingredient is a pain. That’s where Shaken comes in, each box conveniently providing you with everything you need to make five bar-quality drinks at home. It was important that our first retail packaging stood out on shelf and really grabbed the attention of consumers. And in Fortnum & Mason, we knew we had to achieve an incredibly high level of polish and quality. The outer sleeve is printed matt black and uses a gloss finish to highlight cocktail themed icons. The outer packaging also features a sticker that wraps around the end of the box, highlighting key cocktail and ingredient information, and acting as a security feature. An additional leaflet, featuring recipes and tasting notes also sits within the packaging. “The end result is a sophisticated new retail pack that is appropriate for everyday use and gift-giving,” adds Andy.